Comprehensive and comprehensible, this classic text covers the basic and advanced topics essential for using factor analysis as a scientific tool in psychology, education, sociology, and related areas. Emphasizing the usefulness of the techniques, it presents sufficient mathematical background for understanding and applying its use. This includes the theory as well as the empirical evaluations. The overall goal is to show readers how to use factor analysis in their substantive research by highlighting when the differences in mathematical procedures have a major impact on the substantive conclusions, when the differences are not relevant, and when factor analysis might not be the best procedure to use. Although the original version was written years ago, the book maintains its relevance today by providing readers with a thorough understanding of the basic mathematical models so they can easily apply these models to their own research. Readers are presented with a very complete picture of the "inner workings" of these methods. The new Introduction highlights the remarkably few changes that the author would make if he were writing the book today. An ideal text for courses on factor analysis or as a supplement for multivariate analysis, structural equation modeling, or advanced quantitative techniques taught in psychology, education, and other social and behavioral sciences, researchers who use these techniques also appreciate this book’s thorough review of the basic models. Prerequisites include a graduate level course on statistics and a basic understanding of algebra. Sections with an asterisk can be skipped entirely if preferred. 1.Introduction to the Classic Second Edition 2. Introduction 3. Basic Factor Models 4. Matrix Algebra and Factor Analysis 5. Geometric Representation of Factor Models. 6. Diagonal and Multiple-Group Analysis. 7. Principle Factor Solutions. 8. Confirmatory Maximum Likelihood Solutions. 9. Determining the Number of Factors. 10. Rotation and Interpretation of Factors. 11. Rotation. 12. Higher-Order Factors. 13. Factor Scores. 14. Relating Factors Across Studies. 15. Data Transformations and Indices of Association. 16. Two- and Three-Mode Factor Analysis. 17. The Replication and Invariance of Factors. 18. 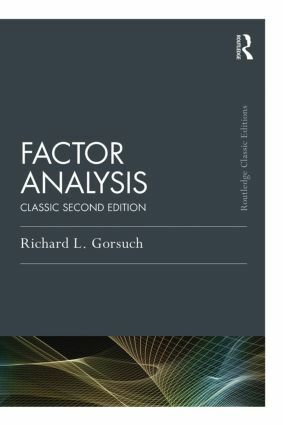 Factor Analysis as a Research Technique. 19. Epilogue. Appendices:　Data for Examples. Computer Programs for Factor Analysis. Accuracy of Computer Processing. Richard L. Gorsuch is Senior Professor of Psychology at the Fuller Theological Seminary. He is known for his book Factor Analysis (1983), and for the development of the software program UniMult.